HTML4 Intermediate - What is XHTML? What is XHTML?S2C Home « What is XHTML? 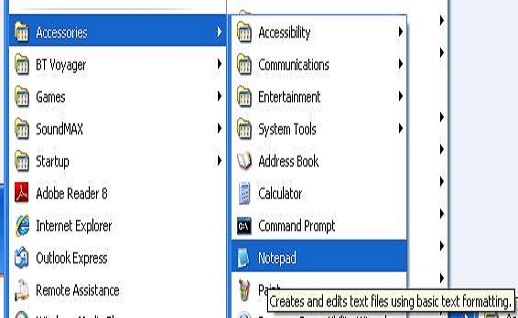 In the HTML Basic Tutorials we used notepad to edit and save our files. I'll just reiterate the basic tools and setup for people that are jumping straight into the intermediate tutorials. The HTML Basic Tutorials introduced a number of HTML tags and in these lessons we will expand on that foundation. In this lesson we introduce XHTML to the party and discuss the differences between HTML and XHTML. We include comments in our documents for the first time using the <!--...--> tag. We also let the browser know which version of HTML/XHTML we are using with the <!DOCTYPE> tag. The <!--...--> tag allows us to comment our code. The <!DOCTYPE> tag lets the browser know which version of HTML/XHTML we are using. click the Folder option and call the folder _HTMLIntermediate and press enter. HTML Tutorials - Intermediate HTML Lesson 1 - What Is XHTML? In the Save in: tab at the top make sure you are pointing to the _HTMLIntermediate folder we created above. As you probably noticed we introduced a couple of new tags. Lets get the <!--...--> out of the way first. This tag allows us to document our code with useful comments and is ignored by browsers. Just replace the ellipses with the comments you want to enter. The tag can be used multiples times in a HTML document. The <!DOCTYPE> was the other tag added to the code and flies in the face of convention. The tag must be entered in uppercase and has no closing tag. So what's it all about Alfie? Well, although the <!DOCTYPE> isn't technically a HTML tag you should put one at the start of every HTML page you write. This tag goes before the opening <html> as the very first thing you put into every file. The <!DOCTYPE> tells the web browser which version of HTML/XHTML you're using and also points to a Document Type Definition (DTD) file. The DTD is an XML document that holds valid values for all tags, their attributes and values, for a particular type of HTML/XHTML. If you don't use the <!DOCTYPE> tag or misspell it, most browsers may enter 'quirks mode' and try to interpret your code as it sees fit. This can lead to your pages not being displayed correctly and other, well quirkier issues that may have you running to change code when its all down to a missing <!DOCTYPE>. The bottom line is: use the <!DOCTYPE> to let the browser know which version of HTML/XHTML you're using and which rules to apply. Following is a list of DTDs for HTML/XHTML as proposed by the World Wide Web Consortium, more commonly known as W3C. Framesets are allowed by this DTD. <!DOCTYPE html PUBLIC "-//W3C//DTD 4.01 Frameset//EN"
Use this if for some strange reason you want to use frames and you turn into a werewolf on a full moon. Contains all HTML elements INCLUDING deprecated and presentational elements. Framesets are not allowed by this DTD. <!DOCTYPE html PUBLIC "-//W3C//DTD 4.01 Transitional//EN"
Generally used for legacy code where deprecated elements are still used. Contains all HTML elements EXCLUDING deprecated and presentational elements. If you wanna use HTML instead of XHTML, then this is the baby for you. Use this if for some strange reason you want to use frames and you still believe in the tooth fairy. For XHTML this is supported in all browsers. Recommended and the <!DOCTYPE> we will use from now on in these lessons. Allows the use of modules. The newest version of XHTML, but not supported in all browsers. Recommended but to get it to work in all browsers is beyond the scope of these tutorials. What's the Difference Between HTML and XHTML? XHTML doesn't allow the omission of certain tags such as the <!DOCTYPE> document root element. All XHTML elements must be within the <html> document root element. XHTML elements must be written in lowercase. Remember <!DOCTYPE> isn't a HTML element. XHTML attribute values must always be enclosed in quotes. XHTML attribute minimization is not allowed. XHTML parsed documents are compliant with the Xtensible Markup Language (XML), this is a good thing. Adaptability with all browser types and devices such as mobile phones. XHTML doesn't allow the omission of certain tags for compliance, a good habit to get into. XHTML demands that you close your tags, another good habit. XHTML demands that you nest your tags correctly, yet another good habit. Validate the HTML from the lessons and your own HTML using the W3C Validator available at the link. Just cut and paste your code in and use the appropriate <!DOCTYPE>. Well that's the heavy stuff out of the way. From the next tutorial onwards we will be using the XHTML 1.0 Strict <!DOCTYPE> for all our lessons. In the next lesson we bring more structure to our web pages using the <div> and <span> tags.